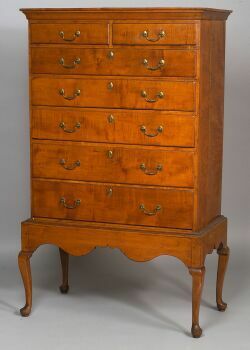 Queen Anne Maple Chest-on-Frame, probably southeastern New England, last half 18th century, the flat molded cornice above a case of two thumb-molded short drawers and five graduated long drawers set into a frame with mid-molding and four cabriole legs ending in pad feet with shaped returns joined by a valanced skirt, the brasses appear to be original, old mellow refinish, (very minor imperfections), ht. 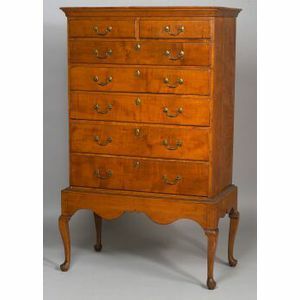 59 1/2, case wd. 33, dp. 17 3/4 in.